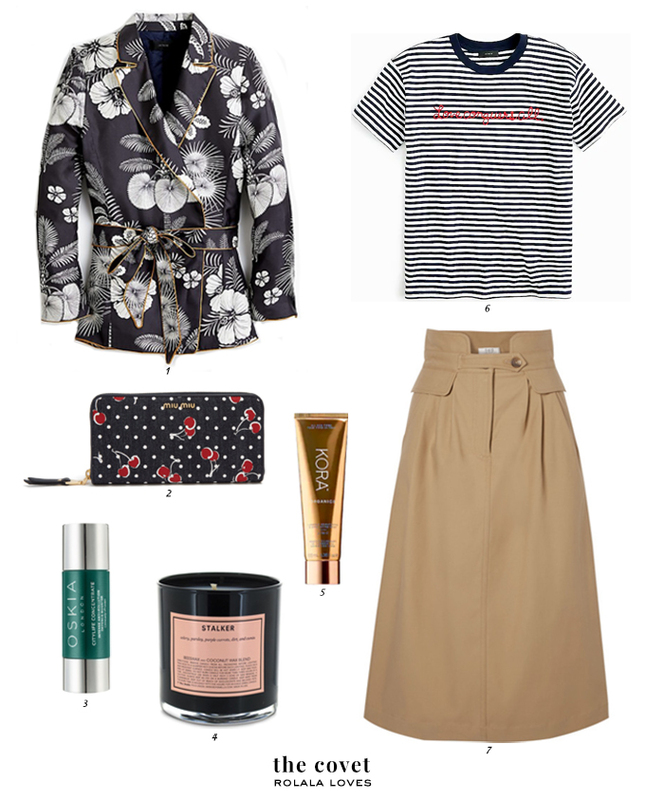 It's kind of a mixed bag with this month's wish list and these are some of the things that have captured my attention lately. In my last post I was wearing the pants that go with this blazer and after seeing the entire outfit styled on a mannequin, I couldn't get over how chic it looked. And this will be one way to get away with wearing pajamas in public. How fun and whimsical is the cherry print on this wallet? And it's on sale too! I was excited about this product as soon as Georgie Cleeve, founder of OSKIA described it when I met her earlier this year. It sounds like a total must have. This concentrated booster with micro-encapsulated Vitamin C can be combined with the skincare product of your choice and essentially acts like a shield to protect skin from indoor and outdoor pollutants. The name of this candle amuses me and it's actually so named because one of the candle’s main notes is celery stalk. Anyway I'm already a fan of Boy Smells and I'm intrigued. The double detox and brightening action of this mask sounds appealing and I'm in the market for a new brightening mask since I'm about to finish up my Herbivore Brighten Pineapple Enzyme + Gemstone Instant Glow Mask. I'm all about a good striped tee especially when it also happens to contain a positive affirmation. The classic styling and midi length of this skirt make it a wardrobe staple and the corset-like waistband is such a cool detail. I've partnered with Formulate to give away a fully customized shampoo and conditioner set. Check it out here. Nice list Rowena! I love that midi skirt! Have a great week! Yes I loved your pants! The print is so chic and who doesn't like fab pjs right? Ooh and I love the waist on the skirt too - it's all about the unique details. LMAO....the name of that candle is awesome:D And loving the J crew blazer as well. Great picks as always! Both the silk wrap blazer and midi skirt are gorgeous! I'm craving them now, too. 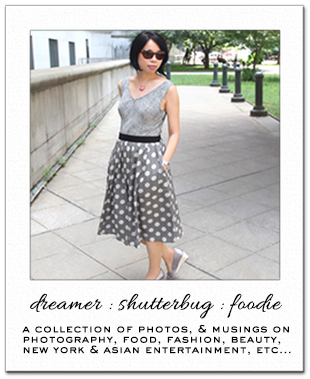 That midi skirt looks beautiful, Rowena! And do let me know your thoughts on the Kora mask if you do get it, I've been curious about the brand. OMG that jacket is everything. I have a coupon for J Crew, hmmm. Great picks as always. What a great list Rowena. I love that midi skirt and that stripes top. Also I want to know your view about the Oskia Citylife Concentrate. Do share your experience with that product whenever you get it. Ok I want to try the OSKIA Citylife Concertrate too! It does seem like a must have, plus I am all about Vitamin C these days! And I need that midi skirt, looks so gorgeous! I love the sound of the Oskia product as well, it sits on my wishlist. In love with the wrap blazer! I am weak for stripes, so I adore that Tee. The name of that candle is hilarious. I want it already! :) Wish you a lovely Wednesday. I am so in love with that floral blazer. PJ chic for sure. I mean I am a huge fan of this trend already but I love the floral twist. It's still in line with that style but feels a little more elevated.